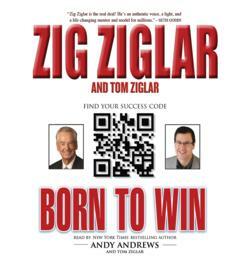 Zig Ziglar’s Born to Win: Your Ultimate Success Audiobook, compresses four decades of life-changing tools and practices into one inspiring, concise, easy-to-use format for people who want to grow and improve the whole spectrum of their lives now! Zig has always taught that “You were born to win, but to be the winner you were born to be you must plan to win and prepare to win. Then and only then can you legitimately expect to win.” Born to Win guides listeners through this plan-prepare-expect strategy. You will learn that when you have the hope that things can change, and a plan to make that change possible, you can take action. Zig Ziglar’s whole-person, balanced-living approach to life has inspired millions to enjoy good health, a new depth of love and gratitude for family and friends, financial security and independence, and spiritual peace of mind. His instruction on how to live a life that leaves no room for regret or worry is the starting point for a joyful, exciting, vibrant life. It is true that when you have prepared yourself to be the right kind of person, you can do what you need to do to expect success. When you truly understand that you were born to win, you can change the world! Enjoy this unique production as performer and comedian Andy Andrews reads Born to Win. At times, you will think you were listening to Zig himself! Be on the lookout for special guest performances with personal stories from Tom Ziglar, Zig’s son and CEO of Ziglar, Inc.
ZIG ZIGLAR, world-renowned author and speaker, has an appeal that transcends barriers of age, culture, and occupation. Since 1970 he has traveled over five million miles across the world delivering powerful life-improvement messages, cultivating the energy of change. Mr. Ziglar has written twenty-nine celebrated books on personal growth, leadership, sales, faith, family, and success, ten of which have been on the bestseller lists. His books and tapes have been translated into over thirty-eight languages and dialects. TOM ZIGLAR, CEO of Ziglar, Inc., not only shares a last name with his father, Zig Ziglar, he also carries on his philosophy: “You can have everything in life you want if you will just help enough other people get what they want.” Prior to being named CEO, Tom began his career in retail and direct sales. He joined the Zig Ziglar Corporation in 1987, learning every aspect of the business as he climbed from working in the warehouse to sales, seminar promotion, sales management, and then on to leadership. He is boldly taking Ziglar, Inc., into the world of social communities, Twitter, blogs, and live video webcasts to present the tried-and-true message of hope, integrity, and positive thinking to a whole new audience. Andy Andrews is the author of the New York Times best-sellers The Noticer and The Traveler’s Gift. Hailed by the New York Times as a “modern-day Will Rogers who has quietly become one of the most influential people in America,” Andy Andrews is an internationally known speaker and novelist whose combined works have sold millions of copies worldwide. He has been received at the White House and has spoken at the request of four different U.S. presidents. His second PBS special, “Andy Andrews: The Traveler’s Gift,” is airing nationally to incredible reviews.